Cruz Is Back Now with a Countdown Clock To "Doomsday"
Senator Cruz' crusade against the IANA transition is back in full swing. With the deadline for the expiry of the IANA contract approaching both he and other anti-transition types have been working hard on their campaigns to block the transition. Yes, that's an image of President Obama shaking hands with China's Xi Jiping. And yes, as usual, the message is that the IANA transition equates to giving the internet away to China (and Russia etc.,). The message hasn't changed, but apparently the medium has a little. 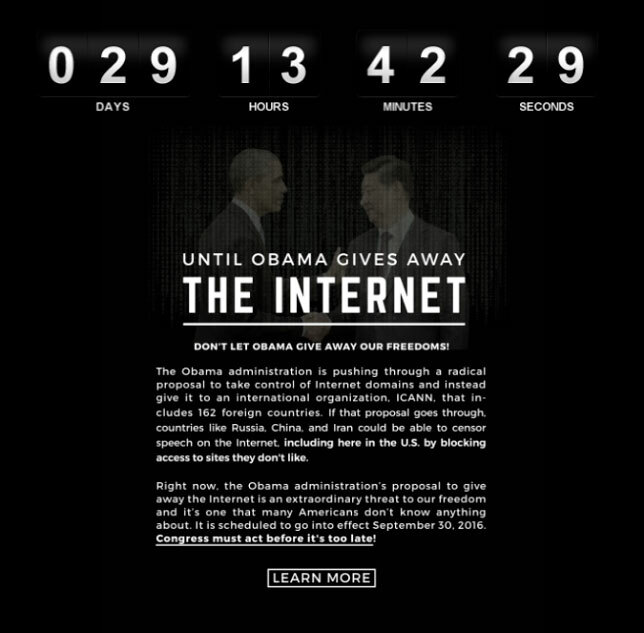 The page lives at https://www.cruz.senate.gov/internetcountdownclock/ and while the clock itself looks well the page itself was probably thrown together quite quickly, as it's lacking much functionality or even a page title (going by the source code). If you click through on the "read more" link you're taken to this page on the Senator's site where you can find most of his anti-IANA transition videos and media coverage as well as a collection of quotes from various people and organisations who support his views. Unfortunately there are no cat videos. Local Time: Thursday, April 25, 2019 09:54 AM PDT – Page Load: 0.4638 Sec.